If you have grown a good crop of corn and you would like to save some of your own corn seeds for growing a crop next year, it can be easily done. Many gardeners save their own seed as a means of saving money and passing down heirloom plants. Saving your corn seed requires that you take some time to properly dry it and store it where rodents can't get to it before you are ready to plant it next season. Allow the ears of corn that you wish to use for seed to remain on the corn stalk for as long as possible, preferably for up to four weeks after the stalk has turned brown. Break the ears of corn from the stalk, and pull back the husks away from the kernels. At this time, remove all corn silk and any other debris that may be on the corn. String the corn up by the pulled-back husks. You can do this by braiding the ears together, or simply by tying the husks to a string. Hang the ears of corn in a warm, dry area where rodents will not be able to get to them. Wait 60 to 90 days, and take down the string of corn. To see if the corn is dry enough to be stored as seed, gently pluck at a few kernels with your finger. If the corn breaks free from the cob, you can now store it as seed. Take each ear of corn and twist it over a paper bag. Grabbing hold of your corn cob, turn one wrist one direction, and one the other direction. The corn seed kernels should fall off into the paper bag. Transfer the seed to a glass jar or metal container that rodents will not be able to chew into. Store until time to use in spring. To protect the ears of corn from pests while it is drying on the stalk, you can cover the ears with small paper bags tied around the bottom. 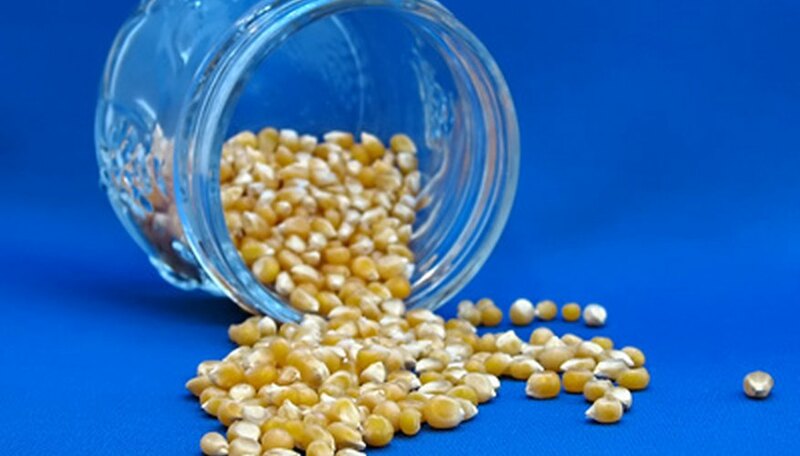 If you find kernels that are still moist or damp when harvesting your seed from the cob, do not store them in a sealed container with the dried kernels, as they can cause mold and rot to occur.